Next time you and I are at the movie theater together, and you ask yourself, "Where did Judith go?" 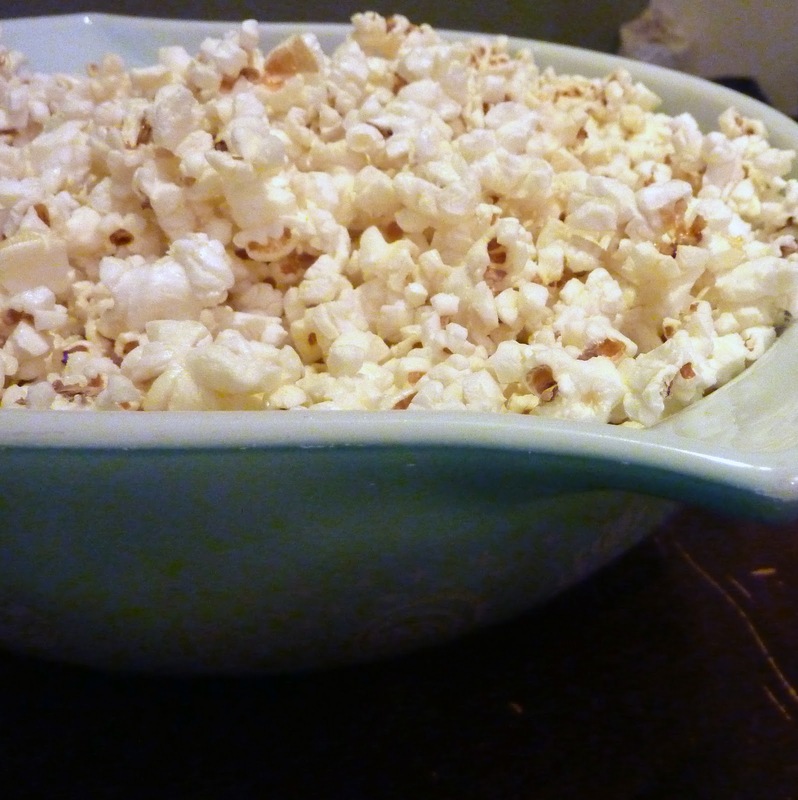 No need to worry - you can find me over at the popcorn butter station. 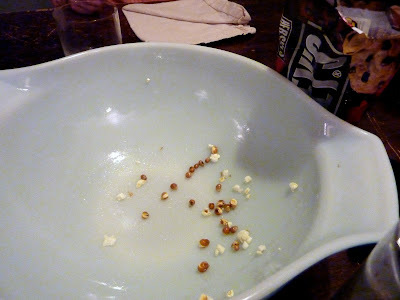 I'll be pouring as much synthetic "butter" over the top of my popped corn as I can before the person behind me kicks me off. 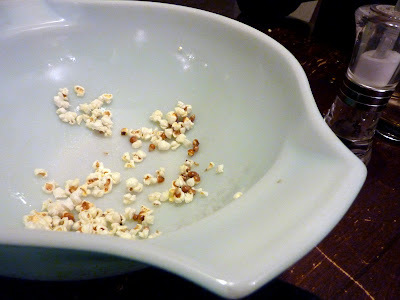 I have a slight compulsion to get as much of that funky oil on those kernels as possible. So much so that when I get to my seat I ask myself, "What was I thinking. Soggy popcorn is gross." On the plus side, at least I get the whole bucket to myself! But last night, friends. Ohhhh, last night. You and I were not at the movie theater together. Rather, Dr. B came over to hang out with my husband. Sometime around 10pm a craving for popcorn rushed over me. Possibly it was due to the mad house cleaning I was doing so late on a Friday night in preparation for a baby shower I was hosting in the morning. Or perhaps the cravings struck because last time Dr. B was over he told us that he could make "the best" popcorn we've ever tasted. I needed to know. So the men took off for the store to secure the materials. They talked about riding Razor scooters. But I think they walked. 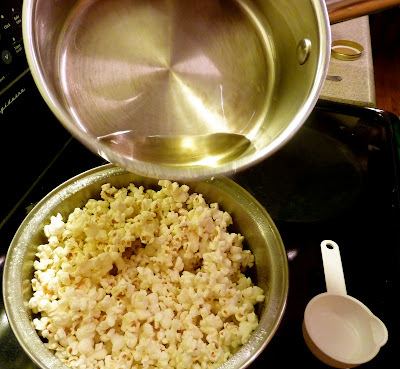 Melt 3 TBS coconut oil in your popcorn popping pot. 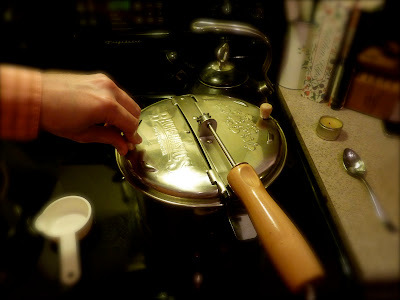 Place three kernels in the pot. 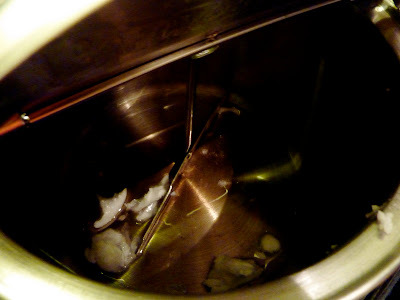 The oil is at the right temperature when all three have popped. Add the rest of the popcorn kernels and close the lid for fear of sustaining a coconut oil injury. That stuff gets HOT! 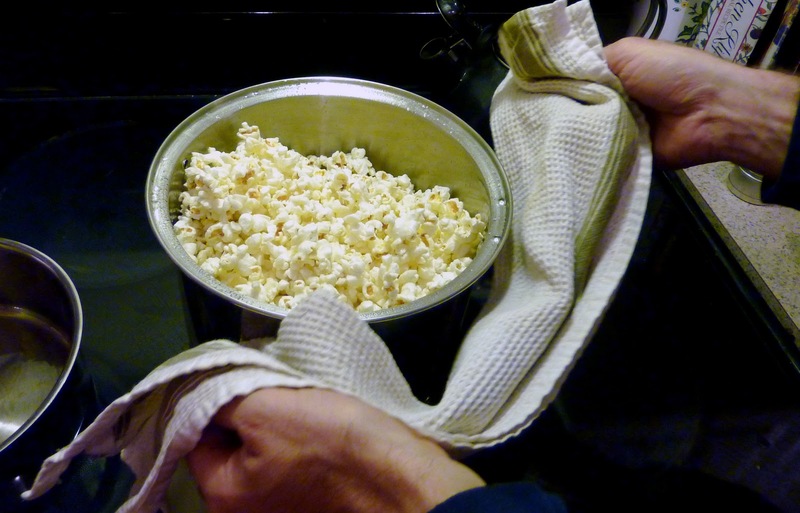 Stir it, shake it, allow those kernels to jump around. Once the rate of popping has slowed significantly, it's time to open it up. In the meantime, you've melted 2 TBS coconut oil in another pan. 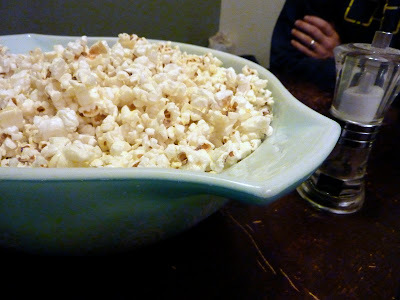 Now is the time to drizzle that over the popcorn. Add as much salt as you like. Shake it about. And the chocolate chips make an appearance. It was a good night! this is on my list. Thanks for the post! Bwahhh-haha. I have been tracking the 'perfect popcorn' for quite a while. Please know that I make mine with coconut oil too. But it was lacking 'that certain something' (can't spell it in French) Now, after seeing Dr. B's rendition, I have my answer. More coconut oil, and melting more before adding over the top of popcorn. Mystery solved! We count on you for these things. Thanks for the insight! It was a heaven-sent revelation for me too. 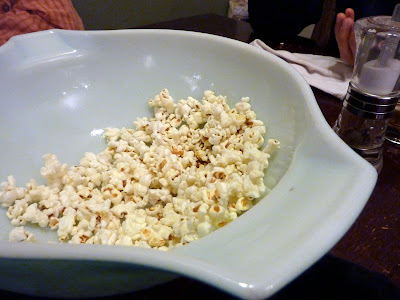 One more secret from Dr. B ~ TRUFFLE SALT. Girl, you will faint!